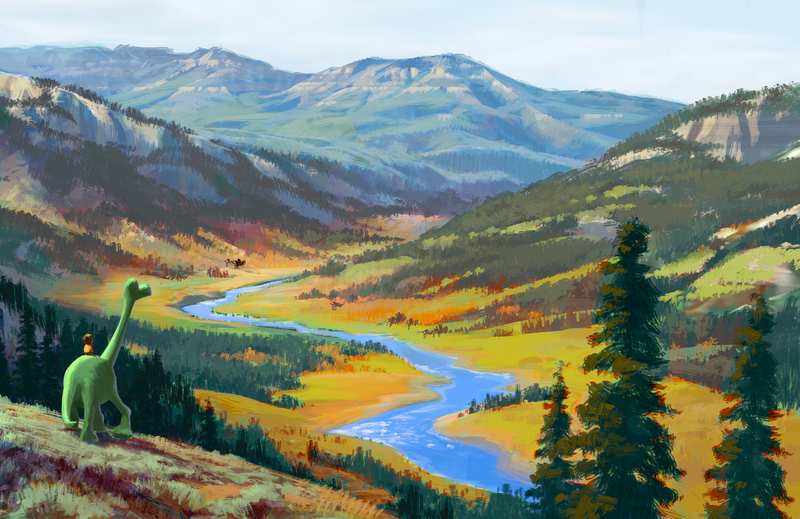 Just last month we got yet another new piece of concept art from Pixar Animation's forthcoming fall release of The Good Dinosaur. The film has had some trouble coming together, but recently named Peter Sohn as the official director after the Pixar brain trust took it over from director Bob Peterson (Up) to overhaul the animated story of a dinosaur who befriends a boy. Now another piece of concept art has surfaced for the film, and of course, it's just beautiful. Since the film doesn't come out until next fall, we probably won't get a teaser trailer for this prehistoric adventure until Pixar's Inside Out hits theaters on June 19th. Look now! The Good Dinosaur is directed by Peter Sohn (director of Partly Cloudy, animator on The Incredibles and WALL-E). Dinosaurs are the dominant species on Earth (since the asteroid missed and they lived on for millions of years). One day one of the dinos, named Arlo (Lucas Neff of "Raising Hope") discovers a human toddler that isn't afraid of these creatures, and they adopt him as their pet. Neil Patrick Harris and Judy Greer voice Arlo's siblings Cliff and Ivy while John Lithgow and Frances McDormand voice Poppa and Momma. Bill Hader also lends his voice to the film which Disney releases November 25th, 2015 next fall. Wow! Looks very good. Concept art is good stuff.